This snack could easily become as popular as pretzels. It is a crunchy spiral, made from roasted chickpea flour and rice flour, shaped by forcing soft dough through a star-shaped nozzle or disk. 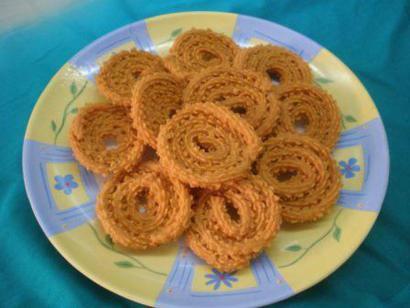 A seviya machine is used to shape this and several other fried snacks in this chapter. It is available at Indian grocery stores. Because any star shape will do, you can also use a pastry bag fitted with a 5-star nozzle or a continuous-flow cookie gun, like the sawa, available through the William Sonoma mail order catalogue. Note: This amount applies only to yellow Cobra brand. Reduce any other asafetida by three-fourths. 1. Place the chickpea flour in a heavy pan over moderate heat and dry-roast, stirring constantly, for 3-4 minutes or until the color darkens one or two shades. 2. Transfer to a large bowl, add the rice flour, salt, cayenne, asafetida, baking soda, sesame seeds and coconut, and stir to mix. Pour in the oil and then rub between your palms until the mixture resembles coarse bread crumbs. Add the water and work into a soft dough (similar in texture to cold mashed potatoes) that can easily be forced through a star nozzle. If necessary, add sprinkles of flour or water. Divide the dough into 2 or 3 portions. 3. Brush oil on the inside of one of the suggested utensils and add a portion of dough. Line a baking tray with aluminum foil and brush the foil with vegetable oil. Starting at the center and using steady pressure, force the dough out of the utensils in a continuous outward spiral until the diameter is 2 inches (5 cm). Shape all the chaklis in this way. 4. Heat 2 ½ inches (6.5 cm) of ghee or oil in a karai or deep-frying pan over moderate heat until the temperature reaches 335 F (170 C). Using a spatula, transfer 8-10 chakli spirals to the hot oil, or as many as will float on the surface without crowding. Fry for 3-4 minutes on each side or until crispy and golden brown. Remove with a slotted spatula and drain on paper towels. Fry the remaining pieces in this way. Serve at room temperature. Can be stored in an air-tight container for 2-3 weeks.